For most Delhiites, the name Tis Hazari is synonymous with the district courts complex in north Delhi. Several important cases in the Capital, be it criminal or civil, are first heard here. 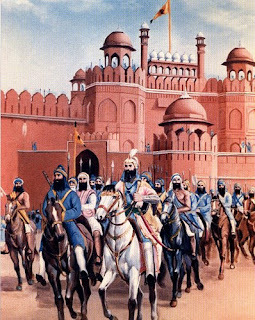 neighbourhood near the northern ridge, with vehicles moving cheek by jowl throughout the day, was once a sprawling ground, where a large Sikh cavalry camped. Tis Hazar in Hindi would literally mean 30,000. So, there were 30,000 Sikhs and, so, the name. Some believe it was a stable for 30,000 horses of 4,000-people strong Sikh contingent. Baghel Singh held Delhi under sway for months in 1783 during the reign of Mughal ruler Shah Alam II. He is credited with exploring places in Delhi that were associated with Sikh Gurus and for constructing gurdwaras there. According to the information on the website of Tis Hazari courts complex, it is the largest district court in Asia with about 400 court rooms. The construction began in 1953 and it was inaugurated in March 1958. Incidentally, authorities claim that more than 50,000 people visit the Tis Hazari complex daily. How’s that?